I met Graham when I was living in Nashville and the 5.5 hour drive to West Virginia had its landmarks. 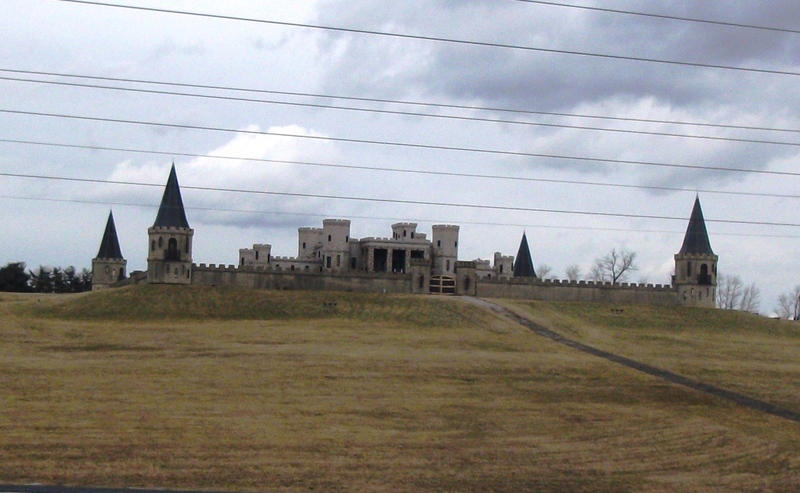 West of Lexington, in the adjacent horse country town of Versailles, we watched a castle being built! Nestled in the spectacular landscape of the beautiful surrounding horse farms and close to the airport, CastlePost offers luxury lodging, rooms for a private dinner party or a family wedding. I stayed in a castle hotel in Germany when I was there eons ago in 1981. It was early December and we were heading over to the Christkindlesmark at Nuremburg. 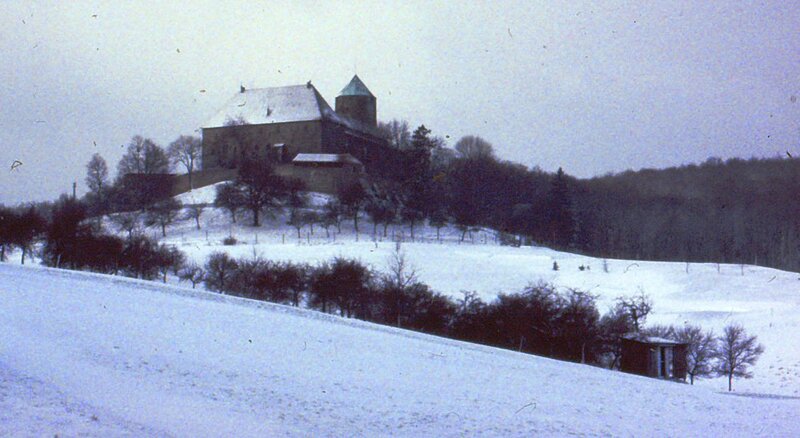 Schloss Colmberg provided an authentic medieval castle hotel at an affordable price. Most modern pseudo-castle hotels are pricey, but there are many ancient converted homes that offer pricing comparable to other lodging nearby and you can cherish the experience of stepping back to medieval times. For example, the Pentilillie Castle and Estate located near Plymouth in Cornwall, Great Britain, offers bed and breakfast lodging. With nine double ensuite rooms, including a handicapped accessible room on the ground level, the kitchen makes an effort to serve local foods as much as possible. Dinner is available some evenings in the summer. Rates range from 130 to 210 pounds (currently $208 to $336). The estate is also available for weddings and many events are held there including theater, fashion shows and garden tours. As exotic as a trip to Morocco sounds, wouldn’t a stay in a kasbah be an experience to top it off? 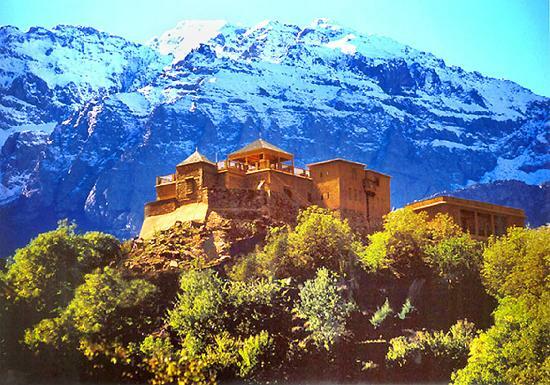 The Kasbah du Toubkal has been identified as one of the world’s best 100 hotels by Conde Nast Traveler. Located just 40 miles from Marrakech at the foot of Jbel Toubkal, the highest peak in North Africa, the hotel is the product of an imaginative Berber and European partnership which prides in offering hospitality in the former of a Feudal Caid rather than as a hotel. Room prices vary from 130euros for a room fitting 3 people to 820 euros for a 3 bedroom house (currently $170 to $1075). Check out the website for the activities that are offered to trek into the mountains. A 20th Century castle in Cold Spring Harbor on Long Island, New York, Oheka Castle was built in the Roaring 20s as a private home. The property fell into disuse and was purchased and renovated in 1984 into a 32-room hotel, with rooms for weddings and other events. Room rates are between $395 and $1095 per night. This entry was posted in Architecture, Bed and Breakfast, Budget, Europe, Family Travel, High Value, Historic Interest, International, Kentucky, Lodging, Travel and tagged Africa, back roads, castles. hotels, custom trip, Europe, high value, landmarks, lodging, unusual. Bookmark the permalink.